Oh, so that’s what grass looks like. 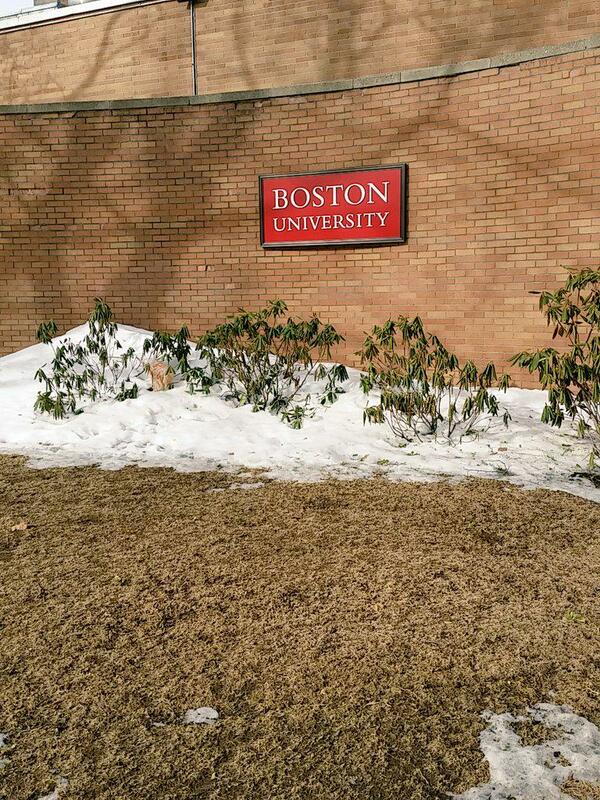 This photo, courtesy of Boston University’s Club Sports office, was taken just across the street from where I live. You know what that is? Grass. You know what I haven’t seen in months? Grass. You know what I’m doing now? Crying, because if this snow can finally get the hell out of Boston and allow me to go out for donuts every morning like I want to then everything is okay. This winter has turned me into a non-donut consuming monster. I will not stand for it. This is beautiful progress. Later this evening I will be flying thousand of miles from any snow piles, but this makes me happier. Because if I can come back this week to a severely reduced snow tundra outside my winter then I might buy a motorcycle for everyone I know at BU purely out of joy. It’s almost over. Our long, city wide nightmare is apparently at its end. I’ll be waiting for my motorcycle.